Part of Broken City Lab’s exhibition at Stride Gallery this summer. No matter where you are in the world and no matter what time of day it is, if you’re longing for the Bow River, then just pick up the phone. 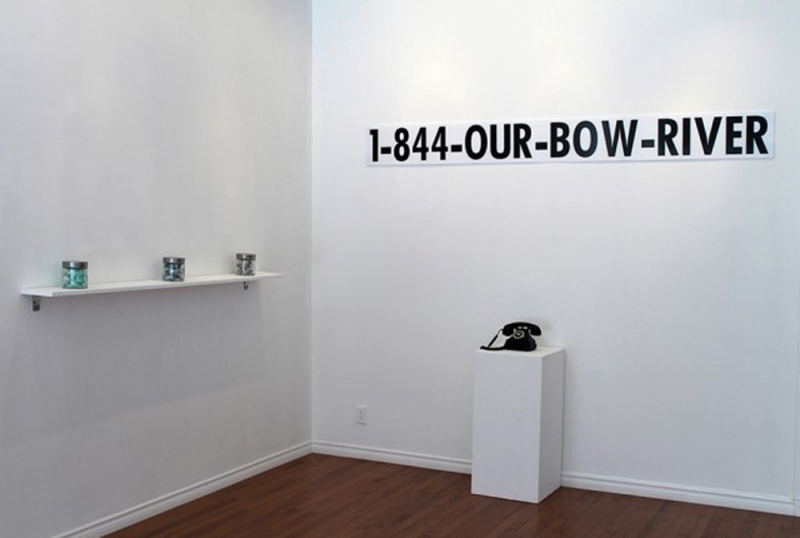 Until the end of August 2015, call 1-844-OUR-BOW-RIVER to hear its watery, babbling voice. But this isn’t just a cure for homesick Calgarians far from home. Rather, this is just one part of a temporary public art project. Conceptualized by the Windsor-based artists that make up Broken City Lab and overseen by Tristan Surtees and Charles Blanc, the lead artists of Watershed+ at the City’s Utilities and Environmental Protection, this temporary public art project encourages Calgarians to think about their relationship with the Calgary environment. Thanks to the recent work of Broken City Lab, you can do even more than just call the river for a chat on a lonely, winter evening. If you’re frequently along the river pathways, you might have noticed signs attached to stormwater outfalls. (Or, you might not have – they are designed to look just like City signs, so they blend in seamlessly.) The signs encourage Calgarians to ask questions and examine their own personal relationship with the river. Is the river immense? Is the river tidy? Is the river obnoxious? These are just three of the 100 questions asked on the signs that are attached to various stormwater outfalls across the city, all of which were put up to encourage residents to think about how we individually and collectively experience rivers. While this individual project is unique on its own, it’s part of a bigger project. The Watershed+ artist residency program engages artists by encouraging them to have an experience and create artwork after having that experience. Artists collaborate with others working with water, including engineers and stormwater outfall designers among others, to create a collaborative project that really has a sense of place. What’s unique is how the project engages Calgarians, but also how it mutually benefits the artist and the organization. “Before this, artists didn’t have an opportunity to be integrated through an experience, and the organization can be excited about what they’re doing again,” says Blanc. This cutting-edge residency – this kind of collaborative art isn’t happening elsewhere – means artists can make informed and interesting work that’s meaningful for everyone involved. See the signs and challenge yourself to think about the Bow and Elbow Rivers soon, because this installation will likely be taken down come January, 2015. In the new year, Watershed+ will put out a call for its next artists in residence.